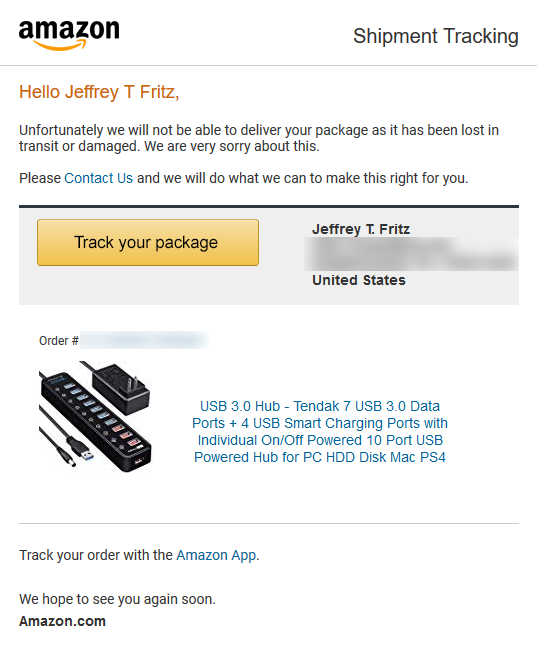 Yesterday, I ordered a USB hub from Amazon and was promised a 24 delivery using Amazon Prime. 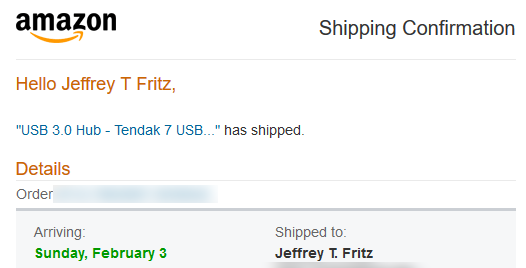 That’s cool, I wasn’t expecting the device until maybe Wednesday, but thanks for the deal! Except… that’s not what happened. It seems there was an accident or my package was lost… but I’m not sure what happened, and I’m even more lost as to my next steps. Let me share what I have heard, and why Amazon makes these RARE scenarios impossible to figure out as a consumer. At 1pm today, while grabbing lunch, I noticed the Echo device in my kitchen was flashing a yellow ring. What the heck does that mean? I opened the Alexa app on my phone, and there was an indicator next to “Activity” when I clicked that, there were no messages or notifications there, but the yellow ring stopped. I checked the ‘Track Shipment’ button from my original email and it reported that my package would not be delivered today. Oh… ok… no big deal, I’ll get it tomorrow I guess. The Super Bowl started, and my Echo started with a yellow ring again. This time I reached out to folks on Twitter and searched for the meaning of the yellow ring and how to decypher it. I was directed to ask Alexa for messages, and she reported I didn’t have any and stopped flashing. Strange again. 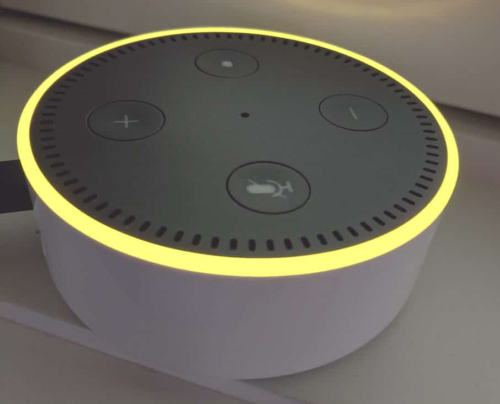 This leads to a real problem in my mind as the consumer: why was this yellow ring appearing, where Amazon is trying to communicate something to me without ANY directions, any indication in the companion app, nor any email that correlates to it if I DIDN’T own the Echo device. Something smells fishy, and I start to lose trust when I get half-hearted attempts at communication from customer service. At 11pm, received the dreaded ‘Package Lost Email’, after the package was promised to be delivered by 9pm. 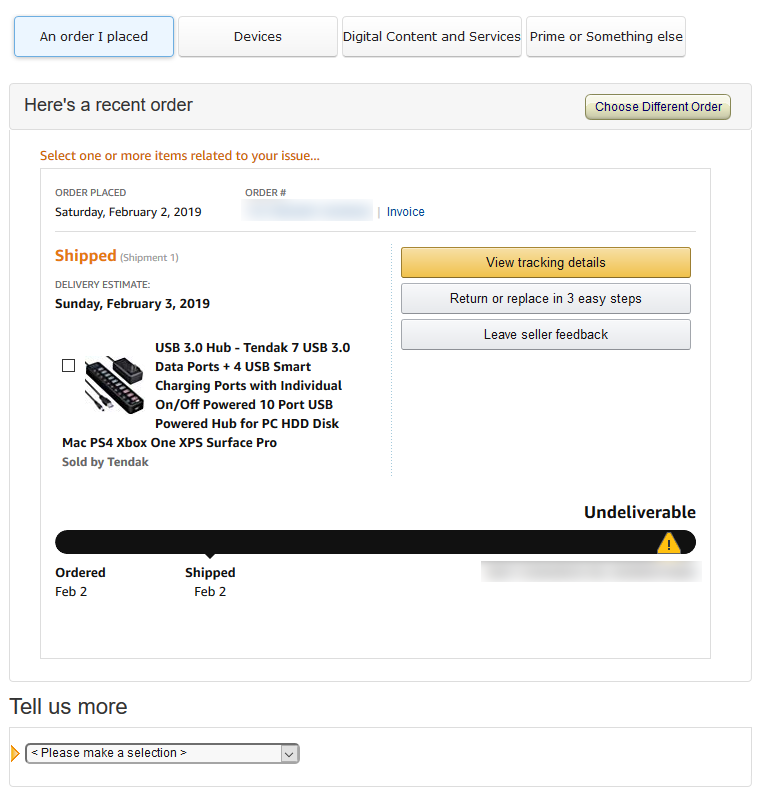 I’m not upset, but more annoyed and think to myself: It’ll be here tomorrow… right? Once again: ‘View Tracking details’ is prominent and right there highlighted as THE action to take. It leads to the previous screenshot, an obvious dead-end. The second option clearly isn’t the answer here either: ‘Return or replace in 3 easy steps’ as I’m not returning or replacing anything – it never made it to me. There’s no feedback for me to leave for the seller either: it was lost in transit. 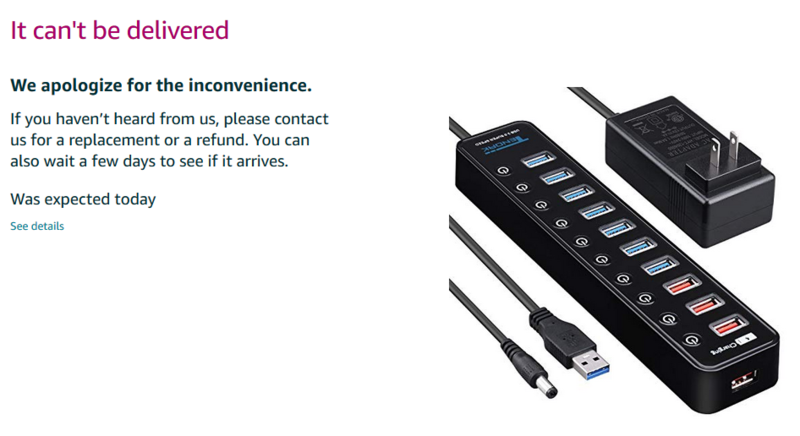 My only option is the ‘Tell us more’ combo boxes at the bottom… there’s just one problem: I don’t know anything about what happened to tell Amazon! What am I supposed to tell Amazon about a problem that I am visiting their website to learn more about? Don’t they know the problem with this order? There are “12 more items in stock!” as their helpful order page reminds me. Why not just ship another one and not even route me through this nonsense? This is a HUMAN problem… not a technical problem. There are accidents, missed connections, and things break all the time. We all understand that, and occasionally these things happen. Simple… I don’t care about what happened, and I’m getting a little thank you credit that I’ll use with some of my own money in the next few weeks to buy something else from the service. Customers are EASILY pleased when you work with them, hide your politics and processes, and give them CLEAR directions on next steps. This entry was posted in Uncategorized on February 3, 2019 by Jeff. I was pretty excited yesterday because a new audio cable arrived for my Mackie ProFx8v2 mixer. How and why would I be excited to receive a patch cable? Why does Fritz need an audio mixer, and should I get one? 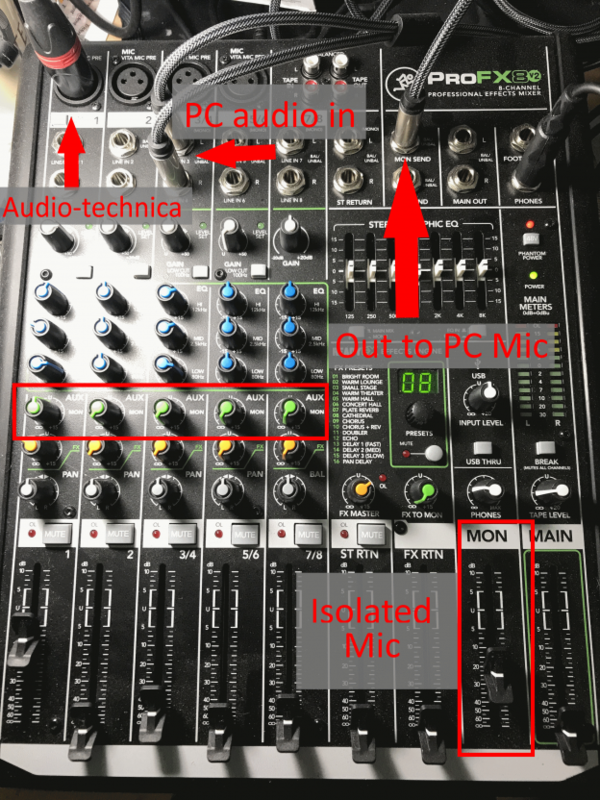 In this post, I’ll show you how I have my mixer configured, the pros and cons of a mixer, and what this latest cable allows me to configure now. This entry was posted in Fritz and Friends, Personal - Software and IT on January 22, 2019 by Jeff. 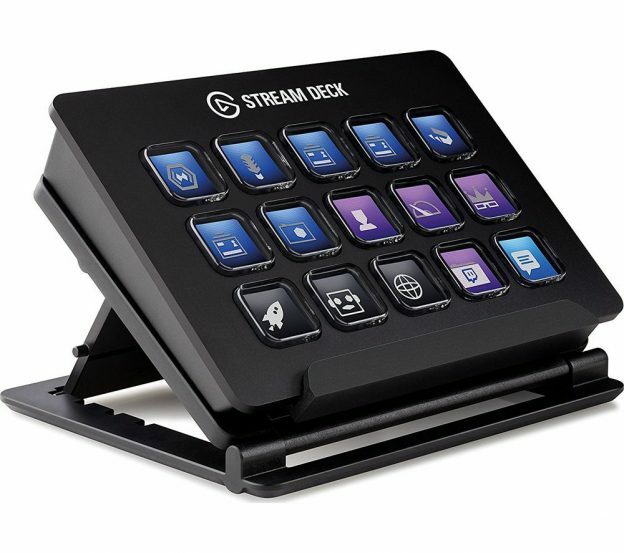 Stream Deck Tricks for Streamers… and Muggles too! I’ve been excited to use the Elgato Stream Deck for about a year now, after much encouragement from other streamers to check it out. Now, I can’t speak more highly of the effectiveness and placement of this device in my arsenal of tools as a streamer. Its my MUST have device when I stream, and I bring it everywhere on the road with me to simplify my process. In this post, I’ll give you the quick run-down about what the Stream Deck is, why it’s so important, and some of the tricks that I’ve configured. 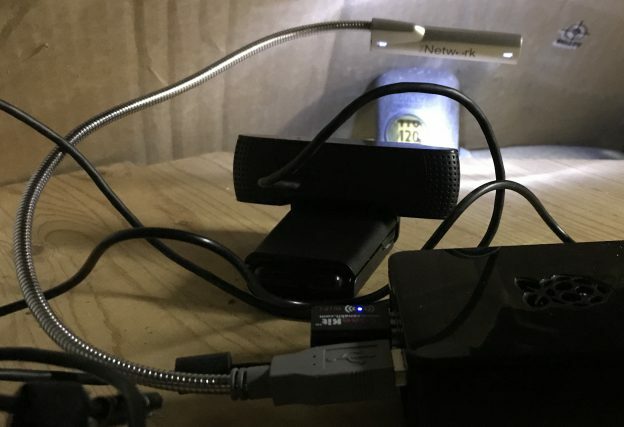 This entry was posted in Fritz and Friends, Personal - Software and IT on January 16, 2019 by Jeff. I’ve been streaming for 14 months now, and enjoying EVERY minute of it. The top question I get again and again is: how do you do it? what equipment, what software do you use? I had a previous post about the setup I use, but I’ve made so many upgrades and updates, I’ve got to share what I now use. Let’s take a look at how Jeff produces Twitch streams at the start of 2019. 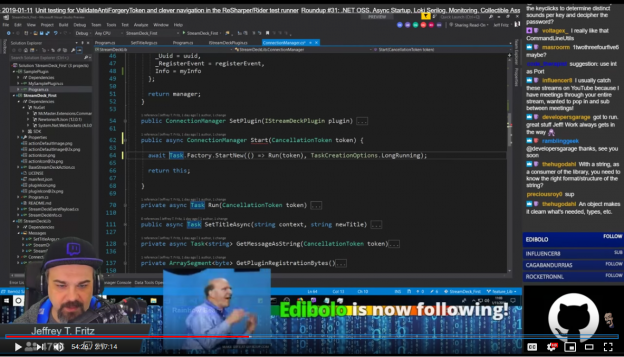 This entry was posted in Fritz and Friends, Personal - Software and IT on January 14, 2019 by Jeff. I’ve had a problem at home that I’ve been dealing with for years: I have an old oil tank that came with the house that I just can’t get rid of. It sits in my basement with pipes that go through the foundation and is larger than my basement door. Literally, the tank was installed BEFORE the house was finished being built. We regularly have biodiesel fuel delivered in the late Autumn, Winter, and early Spring months to heat the house. This artifact from the 1970’s irks me to no end, as I need to monitor an analog gauge to know when to re-order oil for my home. This entry was posted in Fritz and Friends on January 5, 2019 by Jeff.